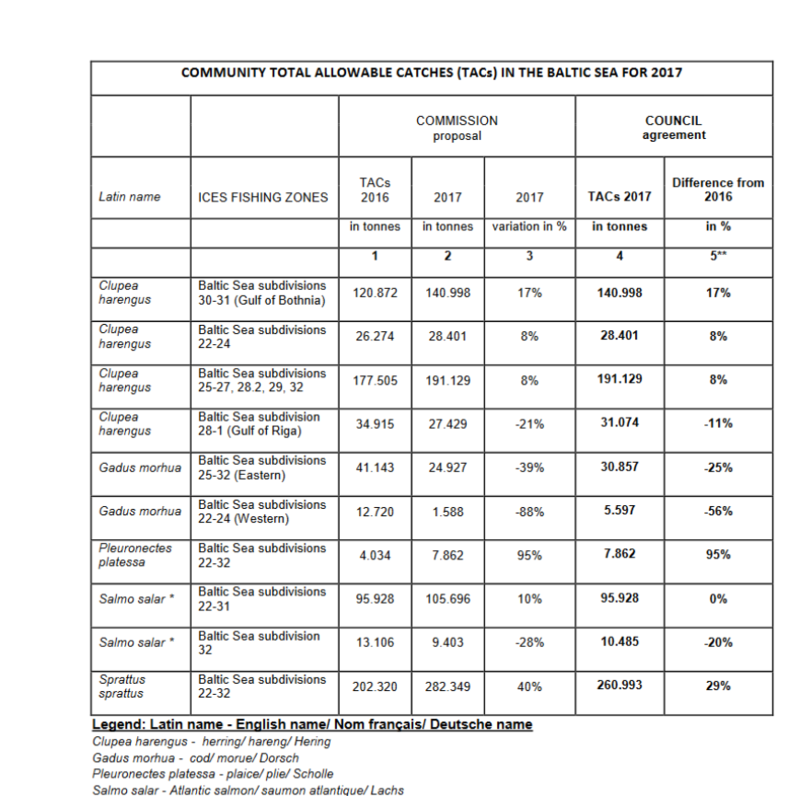 Cod overfishing will continue next year and the Baltic management plan is in tatters despite quota reductions of 56% for the western cod stock and 25% for the eastern. For sprat, the herring stocks, plaice and salmon, we welcome the decisions. They are all likely to all continue their upward trajectory and had their quotas set broadly in line with scientific advice. The Commission and scientists had recommended deeper cuts for the cod stocks, which would have enabled a speedier recovery. Ministers have also committed to reducing recreational fishing on the cod stocks. Vessels up to 15 metres were rumoured to be exempted from the fishery being closed closure the February and March spawning season but this was not included in the final text. We have serious concerns that these quota decisions unnecessarily increase the risk of the commercial collapse of these cod stocks and represent a threat to the long-term viability of local fishing communities. At this point in time with the data and knowledge available, every alarm bell should be ringing. Instead of precaution in this situation, the western cod quota has been set at the absolute maximum of maximums, with some legal arm twisting to squeeze out a little bit more maximum and a little bit less sustainable yield. Insufficient margins for environmental fluctuations have been left and the available subsidy money which could have helped to tie over struggling fishermen will only partially be utilised. At the Council in Luxembourg, quotas were decided late in the night after Fisheries Directors had been unable to conclude the negotiations at BALTFISH because of the difficulties in reaching consensus on the cod stocks, so it was left to the Ministers at Council to decide upon the TACs. It was clear before the meeting that there would be difficult negotiations around both cod stocks and in particular for the western. What was not clear was that the Baltic MAP, signed into force just this summer, would be cast away. The management plan is clear. For stocks where biomass is below Blim quotas must be set at or below Fmsy. For western Baltic cod this meant an F of between 0.15-0.26. ICES advice was based on F=0.15 because of significant recreational fishing, last year’s recruitment failure, and the depleted state of the stock. Instead the decision taken leaves fishing mortality at F=0.35 and this figure is dependent on an over 20% reduction in recreational fishing next year, with no details provided on how this would be monitored. At its first hurdle the Plan has failed. The European Parliament has been hung out to dry and this shows that a regionalised CFP cannot function without them and the Commission being more closely involved. Before the decision, the Parliament rapporteur on the Baltic MAP, Jaroslaw Wales (EPP, PL) said “if the council fails to deliver the results in line with #balticmap then I will take them to court myself”. There is certainly a case to answer. Three factors seem to have swayed the Council on the western stock. That the proposed cut is predicted to lead to a 17% increase in the spawning biomass and that socioeconomic factors were too powerful to ignore. However, a faster and higher probability recovery should have been prioritised. The stock is in such a weak state with a recruitment failure that biomass fluctuations will be less predictable and any unaccounted for environmental variables could be magnified. Moreover, as the eastern and western stocks mix together in subdivision 24 it was argued that a significant proportion of the western quota would be comprised of catches from the eastern stock, thus the F would be within the boundaries of the management plan. For the eastern cod stock a 39% reduction had been recommended but only 25% was agreed. However, the sprat quota was increased by 29% instead of the 40% proposed by the Commission, indicating that species interactions were taken into account and this may represent a further attempt to boost the eastern cod stock. After such a contentious negotiation next year will bring serious challenges to management. Control and enforcement will become a key issue, but with the landing obligation already widely ignored by both fishermen and control agencies as well as new demands with regard to recreational fishing, the cost of tonight’s decisions will likely be far higher than any perceived short-term benefit. Stay informed on news and upcoming event updates. Don't miss things! The Fisheries Secretariat (FishSec) is a non-profit organisation working towards sustainable fisheries in Europe with a focus on the Baltic sea. Subscribe to our newsletter to stay informed about news and upcoming events.